For a few months, my wife and I have been talking about whether we should capture some of the large capital gains that have become available in our dividend growth accounts. We have decided to do it, but only if the gains start to disappear in a market correction or crash. This article describes how we reached our decision and how we will preserve capital gains that the market has delivered to us. I retired at the end of 2001 (age 55), and my wife retired a year later. We retired during the bear market associated with the popping of the dot-com bubble. You can see the crash at the left side of the chart above. The chart begins when I retired. The market fell about 30% in the first 15 months. After the crash, though, in 2003 the market started to rise, and it kept rising for about 5 years. Then near the end of 2007, another market crash began, this one caused by the housing and financial crises, which led to the Great Recession. The beginning of the recession is shown by the gray band at the far right edge of the chart. 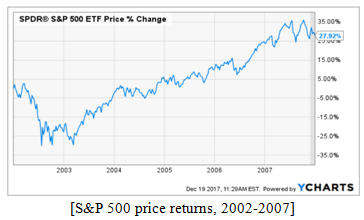 Overall, between the time of my retirement and the end of 2007, the stock market (as measured by the S&P 500) advanced by 28% in 6 years, or 4.2% per year. Historically, that is a low average rate of return. Over much longer periods, the stock market has a growth rate of around 10% annually. My overall strategy early in retirement was based on classic asset-allocation concepts. Beyond stock and bond funds plus a few individual stocks, we also accumulated some oddball things like I-Bonds. 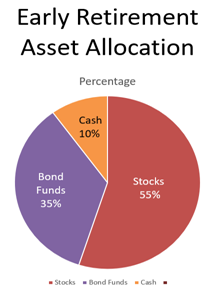 When added together into an overall picture, our assets tended toward an allocation mix of about 10% cash, 35% bond funds, and 55% stocks (mostly in funds). 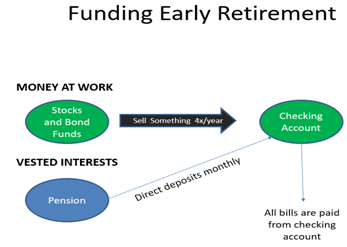 To create “income” for retirement (to supplement pension income), I simply sold things every three months and moved the money into our checking account. I would sell some bond fund shares one quarter, then some shares of a stock fund the next quarter. My recollection is that I chose what to sell based on short-term considerations, like what was hot and what was not. During some quarters I sold nothing. I had a nice consulting gig in 2003-2004 that covered our income needs for several quarters in a row. When I did sell stuff, usually it was around 1% of the total value of our investable assets. So we were following sort of a 4% rule for withdrawals. Unlike the standard 4% rule, though, I did not increase every withdrawal to cover for inflation. Rather, in quarters when our assets flattened or declined, our withdrawals flattened or declined too. My recollection is that we had no trouble adapting to those declines. The changes in income felt like they were at the margin of our overall budget, and they did not affect our core lives very much. Meanwhile, one of my original retirement goals was to learn more about investing and become better at it. I did a lot of reading and studying. From the copious notes that I took from hundreds of sources, I compiled a massive Word document about investing. I kept reorganizing and integrating all the information. I rewrote everything in my own words, discarding duplicative stuff. The Word document evolved into kind of an instructional manual for me. Eventually, I self-published it as a general investment book in 2006. During the years that I was researching and writing that book, I found myself becoming interested in an investing niche that seemed under-appreciated: Dividend stocks. As time went on, my focus narrowed still more to a niche within the niche, namely the strategy that we now all know as dividend growth investing. Part of my interest developed because I was able to see in real life the income needs of retirement. What if our investments produced that income all by themselves? Could we thrive on natural investment income alone, without needing to sell stuff each quarter for ordinary, predictable expenses? Those questions became the focus of my continued investment education. I began experimenting with dividend investing in the early-mid 2000s. I created and began playing around with a small dividend-focused portfolio. Along the way, I did the same thing that I had done with general investing: I created a Word document as a personal manual, and then, and by late 2007, I was refining it into my first e-book about dividend growth (DG) investing. 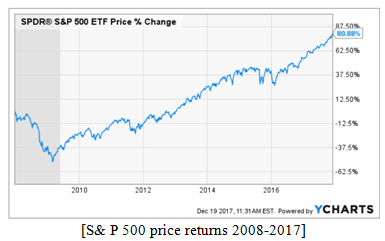 The experimental account eventually became the Dividend Growth Portfolio that I have written about extensively over the past several years. This 10-year phase of my retirement began during the 17-month stock market crash of 2007-2009. The S&P 500 lost about 50% of its value. The crash ended in March, 2009. The market reversed course in March, 2009. Overall the market is up 81% since the beginning of 2008, or 6.2% per year. Again, that annual rate of increase is beneath historical norms. I took Social Security as soon as I could, at age 62 in 2009. That was part of our plan all along; it enabled our early retirements. The SS income took some of the pressure off our quarterly sales of assets. Meanwhile, I was learning more and more about DG stocks: Companies that raise their dividends or distributions each year. The more I learned, the more this idea became very attractive: If you could generate enough money from the dividends of DG stocks, the stocks seemed like ideal cogs for a “money machine” that would fund retirement. • The dividend income would need to be reliable; it couldn’t go up and down the way prices do. I came to look at personal investing not as an activity or hobby, but rather like running a small business. I always wanted to be an entrepreneur, and this was my chance. In contrast to a grocery store or gas station, the personal investing business’s product is money itself. As with any business, you want it to grow. Here’s another aspect of DG investing: If we had a great money machine, my wife and I did not need to worry very much about the market value of the assets. That’s because the bulk of our distributions would come from the cash sent to us by the companies, not from selling stuff. The difference between living off dividends and living off selling stuff is an important psychological distinction. Dividends are independent from the market. All the breathless reports and flashing arrows on TV about the market? Those are all about prices. They don’t matter if your business goal is to build a reliable income stream. The market is not a player in dividends. A TV segment like the one depicted above isn’t all that interesting to a DG investor. The independence of dividends from the market was doubly important in 2007-2008, because the market was crashing! But we were buying stocks in 2008, because we no longer needed to care much about the actual market value of the stocks in our developing money machine. If anything, the crash brought better prices. Things were on sale! Instead of investing for sheer maximization of wealth, our primary financial goal became the optimization of a growing income stream that – when combined with other income sources – would pay for our retirement. As I saw it then and still see it now, “optimization” in DG investing means finding the right balance among the 3 key income factors mentioned earlier: Amount, growth, and reliability. While the crash of 2007-2009 chased many investors out of the market, the cash-machine paradigm meant that I was willing to wade right into the market. In fact, I stopped thinking about “the market” and simply saw the exchanges as stores where I could buy what I wanted. The directional shift in our asset allocation has continued for years. The process is now nearly complete. 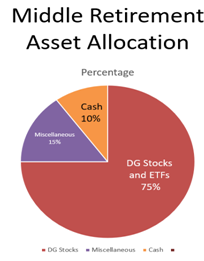 The result is that today most of our investments are in DG stocks. This journey has been a significant shift toward “risky” stocks during retirement, the direct opposite of most conventional advice to shift away from stocks and preserve wealth during retirement. The funny thing is, we don’t feel less safe with the bulk of our assets in stocks. Rather, the shift in objective away from total wealth to money machine has led to SWAN: Sleeping well at night. 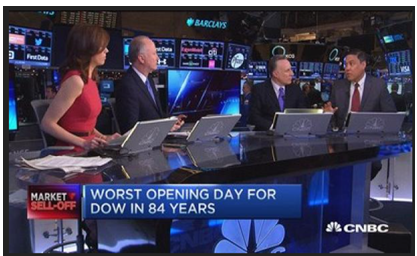 I’ll be the first to acknowledge that, with the 9-year bull market, we’ve been lucky. But some of the luck was the residue of design: Investing for dividend income has led us to be heavily invested in the stock market over a once-in-a-lifetime 9-year bull market when many fled from stocks or have waited far too long to get back in after leaving in the crash of 2007-09. When I used to do corporate strategic planning, one of the key steps was to consider what we called the environment: What’s happening outside the company? We thought a lot about how external changes and trends might impact a division’s sales goal, or the operating plan for the whole company. Since I now treat investing as our own little business, it is appropriate to think about the business’s environment. A lot has changed since 2008. First off, my wife and I are 10 years older. I’m 71 now, and I took my first RMD (required minimum distribution) last year. Back in 2008, RMD’s were a far-off notion that I barely thought about. Second, as mentioned earlier, I took Social Security toward the end of 2008, when I turned 62. Third, the stock market has changed significantly. In 2008, the market was crashing. The economy was in a severe recession. Price growth in most assets was non-existent. Almost all assets fell in unison. The market bottomed on March 9, 2009. It reversed seemingly instantly in a single trading day, embarking on what has become a nearly uninterrupted bull run now approaching its 9th birthday. We didn’t know in 2007-08 that the bull market was going to happen starting in 2009. Indeed, part of the reason for moving to DG investing was so that we could ignore the market. But while we didn’t invest with the goal of sizable market gains in mind, we got them anyway. Because we were investing in stocks (not fleeing the market), the bull market happened for us. The outcome is that – while we were building our money machine for income – we generated and are now sitting on unrealized capital gains of a magnitude that we never contemplated. That is what has triggered our discussions about whether we should capture some of those gains, remove market risk entirely from a portion of our money, and let it coast home. I’ve come to think of the process as “retiring” some of our money. The money has worked hard for us, but times have changed, and the time may be coming to take some of it out of the game entirely. Our plan looks like this. For the first time in many years, I will have a guideline about selling stocks based on price drops. In my dividend growth investing, I have had no such guideline. Thus, after a price drop of more than 20% – which is the standard definition of a bear market – half of our stock shares may have been sold. The remaining shares will be kept and remain invested according to DG principles. The new selling guideline is applied separately to each individual stock and ETF, not to the market as a whole. Since many of our stocks are low in volatility, it could happen that the market drops, say, 10%, but we don’t sell anything. On the other hand, some of our stocks may drop more than the market and be sold even though the market hasn’t dropped 8% or more. Since I’m looking at each holding individually, I may make specific exceptions, but for the most part, the chart above indicates what we will do. In fact, I have already installed sell-stops on stocks and ETFs in my IRA. I will complete the other accounts over the next week or two. I’m using good-till-cancelled orders. At both brokerages that hold the portfolios, those last 60 days. So I will recheck them every 2 months. If prices keep going up, I will reset the sell-stop levels higher, thus insuring that more gains are captured. The stops will “trail” along behind the actual prices of the stocks. There are differences between this plan and traditional retirement strategies that depend on selling assets to create income for retirement. • We are selling voluntarily in order to capture and “retire” some capital gains. The selling is not on an annual schedule to fund our retirement. Rather, it is conditional for each stock. • We are not reallocating to “less-risky” assets like bonds. Proceeds from sales will go to risk-free savings and CD accounts. In connection with that last point, while the purpose is not to de-risk our portfolio in the traditional sense, that is indeed what will happen. Every dollar that we move from stocks into cash will proportionately reduce our overall volatility, because cash and CDs have no volatility. • My Dividend Growth Portfolio that I write about here on Daily Trade Alert. In fact, the DGP’s life has been extended beyond its original 10-year term that would have expired in June of this year. I will continue to reinvest dividends and grow the DGP, and continue to report on it monthly here. Until last year, we were reinvesting all dividends. Our sources of spending money (pension and Social Security) were direct-deposited into our checking account. Since RMDs started for me, and now that almost all of our non-DG assets have been sold off, we’re no longer reinvesting all dividends. Instead, some of the dividends now flow out of our brokerage accounts. If we sell some stocks, those proceeds will also flow out of the brokerage accounts. The following diagram shows how our cash flows work. • I’m now taking RMDs from my IRA, which is all invested in DG stocks and ETFs. • Our taxable Perpetual Dividend Portfolio is also all DG stocks. • I’m taking Social Security. This is our cash management plan. It looks complex, but it’s not, because so many of the flows are automated. All bills are still paid from our checking account, and most of those are automated too. Cash beyond 1-2 years’ needs is in CDs. 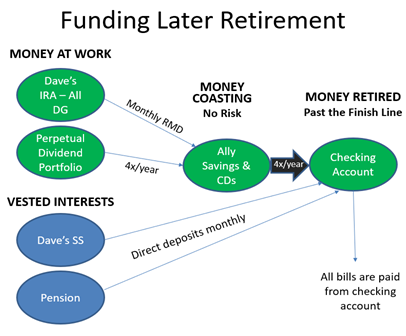 The black arrow labeled “4x/year” still represents my quarterly reviews and the manual movement of cash into our checking account, where it now supplements not only the pension but also SS. No one knows the future. But the question must be asked: Can we meet our retirement income needs if we sell some stock under the new plan? To find out, I modeled 2 scenarios under the new plan to test its viability until 2048 (when I will be 102 and my wife 91). • Scenario 1: We sell 15% of our stock at the beginning of 2018, because of an 8% market correction. • Scenario 2: We sell 50% of our stock at the beginning of 2018, because of a 22%+ market crash. This is a far more stressful test. I found out that the answer to “Will we have enough?” is YES under both scenarios. Even if there is a “crash of 2018,” our money will not run out. In fact, upon our deaths, we can anticipate a sizable estate still left for our heirs. By adding the new guidelines on selling some stocks in the event of price drops, we are not abandoning dividend growth investing. Far from it. At least 35-40% of our assets will be devoted to DG investing under the most severe scenario, presumably for as long as we live. What we are doing is layering another strategy on top of DGI that is almost all based on psychological contentment: Having generated hundreds of thousands of dollars in market gains during the long bull market, we have decided that if the market crashes, we will cash in some of those gains and protect them from further damage. I often say that financial decisions are a combination of math plus psychology. In my house, the psychology is a combination of my own and my wife’s desires. Our blended viewpoint on taking some profits feels right to both of us. We’re both comfortable with giving up a portion of future income growth in exchange for removing some of our money entirely from the risks of the market. In the diagram above, I labeled money removed from the stock market as “Money Coasting.” It’s not in the markets any more, but it’s not just sitting around either. It’s in that realm of investments where you can produce some returns without any risk at all. We’re ready for that. We’ve experienced good fortune on the price side as a result of the DG investing that we did. Our lack of fear of the market allowed us to reap the benefits of stock investing and staying in the market no matter what it was doing. We don’t fear a correction. Rather we have an opportunity to capture many years’ of expected future dividends in the form of price increases that have already occurred. So that’s what we are going to do. Our plan for funding retirement from dividends always had an expectation that at some points – for emergencies or large desirable purchases – we might sell some of our assets rather than incur debt. Our new approach simply formalizes selling for the purpose of capturing gains when we want to. So our plan for funding retirement now becomes a hybrid plan that involves not only DG investments but also money coasting along in savings and CD accounts. It feels very comfortable.